38 S C T / A P R I L 2 0 1 8 Week, an event to promote restaurant deals, at three Simon malls on Long Island, in New York: Roosevelt Field, Smith Haven Mall and Walt Whitman Shops. "There's absolutely no question that restaurants, dining pavilions and nonretail are taking up more space," said a Simon spokesman. "If we take a food court and revitalize it, we definitely message that, put out releases and have media opportunities, but we would do that with anything that is new at the mall." Food took top billing in January when Simon announced that six popular eateries were joining The Westchester, in White Plains, N.Y., as part of a multimillion-dollar renovation that began in 2016. "Westchester's first-class shopping destination will have the first-class dining destination that its loyal shoppers deserve," said Paula Kelliher, the mall's director of marketing, in a press release. At Simon's Arundel Mills, just outside Baltimore in Hanover, Md. (which bills itself as the largest outlet and value retail shopping destination in Maryland), the company last November promoted the debut of its dining pavilion, featuring a dozen eateries in a redone 30,000-square-foot space. Meanwhile, across the country on the opposite coast, Matthew Hammond, a principal at the Southern California–based Coreland Cos. brokerage and property management firm, says he has observed the shift to nonretail and restaurant openings. Coreland's 6 million- square-foot portfolio consists mainly of grocery-anchored shopping centers. 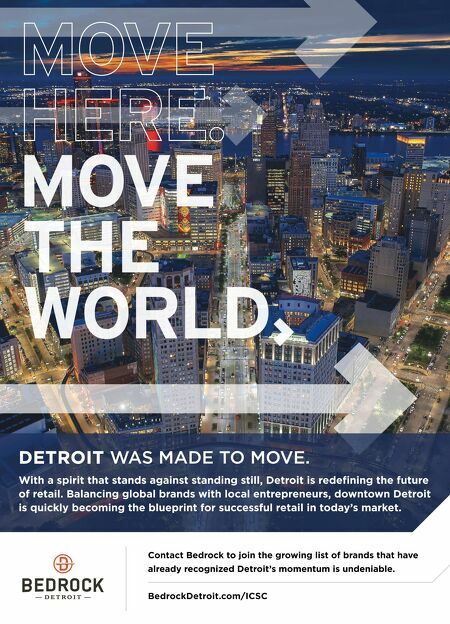 "In 2017 over 70 percent of our deals were restaurants, fitness and services," Hammond said. "Now you make it a healthy lifestyle type of center, whereas before, you'd go out and get the grocery store — or, on a larger project, you'd get a Macy's or a Target. You're basically creating your environment from the restaurants that you get, knowing what type of demographics you're going to attract." CBL Properties converted former Sears stores at two of its malls into a "fresh mix of retail and restaurants," according to Sarah Enlow, marketing director at one of those malls: Fayette Mall, in Lexington, Ky. The other mall is CoolSprings Galleria, in Franklin, Tenn. "The whole shopping center industry is evolving to include more than just retail by incorporating dining and entertainment locations," Enlow said. "It's about bringing more uses to your shopping center or town center destination for people to come, shop and dine and enjoy themselves while they're here." Enlow spared no effort promoting the arrival of the first Cheesecake Factory in the Lexington market of slightly less than 1 million people. "We hit it hard with social media and it worked out well," she said. Last August she promoted the first Fayette Mall Restaurant Week. Every eatery participated, and each offered one menu item for $5, as customers went from venue to venue, sampling the varieties of cuisine. Enlow says her marketing required finding "a new recipe for reaching customers so that we can provide them with relevant information on restaurants they want to visit." As Hammond put it: "It's really the restaurants that drive the development," he said. Thus, these days it seems the rest is just gravy. 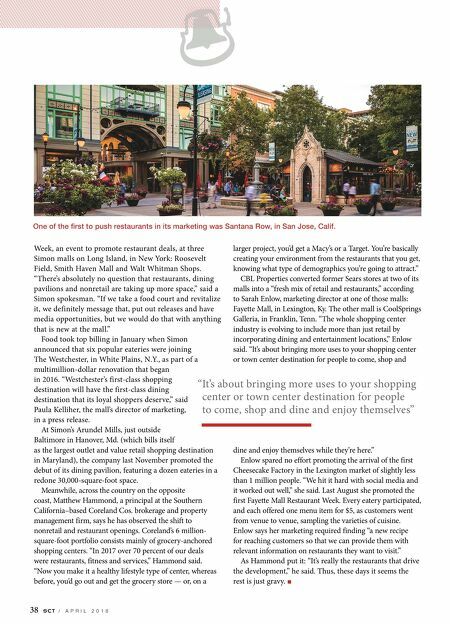 n One of the first to push restaurants in its marketing was Santana Row, in San Jose, Calif. " It's about bringing more uses to your shopping center or town center destination for people to come, shop and dine and enjoy themselves"